I am a total pizza junkie. 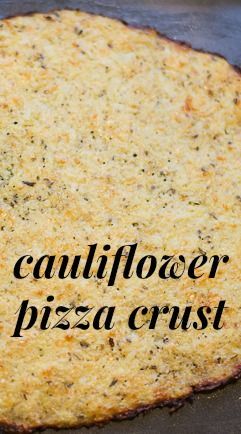 Pizza is the one food that everyone in my family likes to eat, but I find that as I get older, I don’t feel so great after eating all of that pizza dough, which is why I love this gluten-free cauliflower pizza crust recipe. When I started seeing a bunch of cauliflower pizza crust recipe articles popping up online, I knew it was something that I wanted to try. 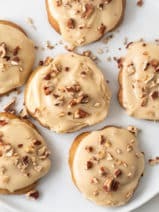 I found a recipe on Eat. Drink. Smile. that looked particularly good to me and decided to give it a shot last week. 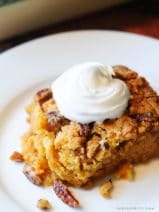 RELATED: Check out my loaded cauliflower casserole, our cauliflower soup, and this yummy keto breakfast casserole. I have to admit, I thought that going through all of the trouble with the cauliflower might be a pain, but it was actually quite easy, and once you get the hang of it, the process is a lot more smooth. This is a really fantastic cauliflower pizza crust recipe, and one that people always ask me for after they try it. My cauliflower pizza crust looks a little burnt around the edges in the photos but it didn’t taste that way it all. Next time I won’t pat out the crust so thin! My whole family agreed that this cauliflower pizza crust recipe makes an AMAZING pie, and I didn’t feel so sluggish after having a couple pieces as I do after eating traditional pizza. If you haven’t tried a cauliflower pizza crust recipe yet, you must. You will be amazed by the fact that it really tastes NOTHING like cauliflower. It just tastes like a yummier dough crust, it’s like veggie-magic! If you’ve been wanting to try a cauliflower pizza crust recipe, now is the time, and THIS is the recipe! I hope you love it as much as we do! 2. Microwave the riced cauliflower in a bowl for 5-8 minutes depending on your microwave. No need to add water. After microwaving, transfer riced cauliflower to a fine mesh strainer and drain completely, gently pressing out excess water. Once drained, transfer riced cauliflower to a clean dish towel and wrap the sides around the cauliflower while gently pressing out excess water. This drying process is important! 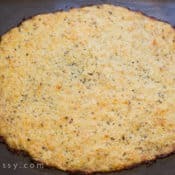 I hope you enjoy this wonderful cauliflower pizza crust recipe! Recipe just slightly adapted from Eat. Drink. Smile. 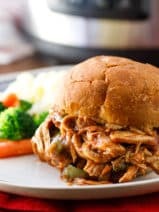 I love this recipe and it tastes delicious. I a have shortcut I would like to share with you all. Instead of buying cauliflower and then having to rice it, There’s a company that already makes riced cauliflower that looks like rice! I have used it before and it gives you the same end result! This is the perfect recipe ! I’ve made it a few times & my entire family loves it. You can’t even taste the cauliflower it’s just so good ! Can you use the store bought cauliflower rice? Tara, I’ve used the store bought cauliflower rice and it works just as well! Can you give the macros?? how many carbs, calories, fat grams, etc?? I did not see in the recipe. Perhaps I overlooked. Thank you! This was Amazing! I made regular pizza for my family and this cauliflower pizza crust pizza for me. I topped mine with sautéed onion, peppers, zucchini, tomatoes and mushrooms. This was the best pizza I have had that was completely gluten free. Even my daughter couldn’t resist trying this. She kept coming back for more. I will definitely make this again. I love cauliflower and the first time I made this recipe I was floored with delight! 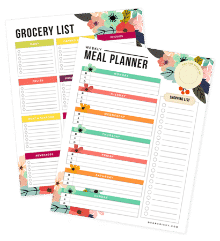 I recently became aware of so many food allergies and this is a great way for me to enjoy my favorite foods and maintain a healthy diet! I’m sharing this with all my friends, it’s great. I was recently diagnosed with Diabetes. I love pizza. What was I going to do? Then I saw this recipe.We’ve made it twice. Delicious! Filling and so delicious. I do add another egg and a bit more cauliflower. Be sure and add Italian Seasoning. I just tried this last night. It was wonderful. The only tweaks I made were I added 2 eggs as opposed to 1. Also, after the cooking time, I flipped it and cooked an additional 5-8 minutes. This made it that it did not crumble at all. My husband cannot stand mashed cauliflower I made him traditional pizza and myself this crust. He was really surprised by how good it was. That is equal to saying it was amazing!!! Thanks for sharing! I’ve made this a few times. I’ve doubled the ingredients to cover the pizza pan and it seems to help with making the crust a little thicker. After trying it a few times I think I finally got it perfect! This makes a small pers sized pizza. I used 2 cups cauli and no squeezing needed. Very good tasting. Great recipe! I omitted the salt altogether, still delicious! This pizza crust turned out beautifully, but it was so salty. I’m going to try it again to see what happened. The texture was wonderful and the recipe was not not hard at all. Thank you! Do you have any nutritional info on this delicious crust? Hoping to try this tonight but I’m out of parm. Would mozzarella work in the crust? I tried this recipe. I am not a cook. I found this to be very simple. I have to perfect it some more. But it was really good. It works well with my Keto diet. Microwaving cauliflower for five minutes left me with not much to work with. Luckily I chopped up plenty. Three minutes worked better and didn’t have to drain afterward. Great recipe nonetheless. Substitute garbanzo bean liquid —aquafava. This was so good. My family loved it! It was much more filling than I anticipated. Loved it! Doubled for a larger pizza. Doubling the salt was too much but otherwise perfect! Step 4 says cooked califlower. How long and at what temperature do you cook it before cooking it again? So glad you loved it, Leigh Ann! Made this recipe today, first time cauliflower crust maker here! It came out really good – I think I could have removed a little more water bc the dough was a little soft towards the center or perhaps I could have made it thinner, as I was worried about it being too thin! But all in all it was yummy and my toddler & husband actually enjoyed it! This was so yummy! I made this with a medium container of fresh riced cauliflower and it made it sooo much easier! Topped with a little red sauce, artichokes, olives and a little mozzarella. Was great as leftovers, too! I will make again!! I forgot something on my first review. I added so many veggies and meat to pizza that I would suggest either pre-cook veggies in microwave or cut down on crust baking time so that they cook more thoroughly. My family loves this and could eat crust alone. However, we aren’t fond of the smell of cauliflower after cooking. Any suggestions? Actually, take a few lumps of real, hardwood charcoal and put them in your air vent or right by the stove. Stuff works miracles! This is DELICIOUS! My husband and I can’t eat gluten and are doing a low-carb diet, so this is perfect. We’re making our second batch of pizzas tonight! Thanks for sharing! Love this recipe. Like it says the trick is to get as much moisture out as possible. I did cut down on the salt by half. I will definitely continue to use the recipe. This dough is amazing, the flavor is great and tastes nothing like cauliflower. Even my cauliflower hating fiancé enjoys it! Win! What if you don’t have a microwave? Can you boil the cauliflower too? Let me know, I would like to try this recipe. I loved it! I did find using frozen cauliflower rice is much simpler than using a fresh head. I then strain mine and blot with paper towels. It’s very delicious! What if you don’t have a microwave! Please helppp!!!! Just made this cauliflower pizza crust and it turned out great. Also made cauliflower wings which were also a hit. What is the cab or nutritional value. I can’t find it. Is this for one person or two? I can’t seem to find anything about how many servings it is. This was delicious. The fact that it was healthy was a bonus! So glad you enjoyed it, Lori! I’ve made this several times now and LOVE it! Thank you so much for the recipe. My only issue is the rich flavor, so I lessened the herbs in the crust and it was perfect for me! Thanks again! You won’t see visible water but if you use a paper towel to test how much water is left in there….on man!! I use SEVERAL paper towels squeezing and squeezing until it is very matted. That way my crust is much more crunchy. I made this tonight and it was so tasty! I love traditional pizza and will still eat it once in a while but need to watch the carbs so I thought I’d see what all the hype is about. I would definitely recommend this to anyone who loves pizza but doesn’t love the carbs! This was excellent! I replaced egg with flax egg and used vegan Parmesan cheese. Using parchment paper it did not stick at all! Simply Awesome and guilt free!!! Would definitely make again and recommend to others! Is the measurement of the riced cauliflower before or after it’s microwaved? We have a slight obsession with Pizza in our home too! This is a great recipe to try! My family has dairy intolerances. Any recommendations to replace the parmesan cheese in the crust? Nutritional yeast has a cheesy flavor so it could work as a replacement in terms of taste, however it doesn’t have the browning properties of the cheese for the crust. It would be worth to try it though. Whole Foods sells a shredded vegan parmesan that works perfectly! The brand is “Follow Your Heart”. everything looks so good, I have done the cauliflower pizza crust, yes it is amazing. next I want to try the casserole with cauliflower, I want to try as many as possible. Such a simple and easy recipe. Absolutely delicious. My favorite so far. I love this recipe!! It is so good just to eat plain, or with a little cheddar melted on top. I also like to make a seafood pizza with it. I use alfredo sauce, seafood (shrimp, crab, and scallops) with mozzarella cheese. So good! Do you use grated parmesan cheese like in the plastic container or shredded parmesan cheese? Do you think the dough could be frozen to use later? Wow, I love the versatility of cauliflower! Rice, mash, tacos, alfredo sauce, I love cauliflower everything. This pizza is my new obsession. I was unsure of the recipe because the cauliflower cooks down a lot and it didn’t look like enough, but it was perfeft. The temp of the oven, timing, seasoning, everything was perfect. I just did mozzarella and basil, but the way this crust holds up, there are plenty of topping options. I can’t wait to make this again! I loved this recipe! I used frozen riced cauliflower from Trader Joe’s. I just cooked it in a pan and then pressed the liquid out. My husband told me it was “surprisingly delicious and you should make it again”. And I thought it was super flavorful. If I would change one thing, I would be sure to spread my toppings into thinner layers. The crust is not as sturdy as bread and was folding under the weight of my sauce, veggies, and cheese. Turned out PERFECT! Thanks so much. Shared with all my friends! Does the 1 cup of cauliflower refer to before or after drying? I ask because I used a fairly large cauliflower and before drying I had 3 cups and afterwards I barely had one. Making it for the 1st time tonight,in the oven right now! Awesome! I love pizza and I wanted a healthy version. Can’t wait to try it out! Well, we just finished dinner – I made 2 pizzas using a triple batch. Everyone loved it! I was surprised at how easy it was – way easier than making dough! Thank you so much for this recipe. It’s now on our regular menu ?? Hi Chrissy, I am totally diggin’ this pizza crust but may be reading the instructions incorrectly. It lists under pizza crust ingredients 1/2 cup of mozzarella, but in the directions, there is no mention of when to add it to the crust. Do you add 1/2 mozzarella cup to the crust or do you just add it on top as one of your selected pre-cooked toppings? Thanks! This is just the pizza topping! Tried this crust for the first time last night…Awesome! My Mom and 7 yr. old granddaughter gobbled it up! Will def be making this again as well as other recipes using cauliflower. My 13 year old son and I ate this for lunch today (with a fork!) It stuck to the pan, but was delicious. He is a picky eater, but said it was good. I’m surprised it was as good as it looked. I’ll try using a different pan next time to eliminate sticking. I wanna try this for so long but I’m doubting about the cheese. I have an intolerance for cheese, can I use less cheese than the recipe? Or different kind of cheese? And another question, can I use only the egg-white or is the whole egg needed? Can this crust be prepared ahead of time and frozen to be used later as a pizza? Do you think this dough is freezable? And if so how? Love this crust, made it twice! I used an egg white & fat free Parm & Mozzerella! Can’t wait to make it again. A BIG thank you!! Made it and loved it! Might use less cheese next time though as I found it a little overpowering. The sides of the crust seem browned and done well but the middle of the pizza is still not crispy as the edges. Any ideas? Yes, I had the same trouble. I too would love suggestions on how to make the middle cook better. I wonder if half way through your put aluminum foil around the crust would keep the edges from browning too much before the center cooks. Sorta like what you do with a pie crust? I made this tonight and we loved it! I was nervous when I mixed the cooked cauliflower with the other ingredients as it appeared to be too liquid, it wasn’t! After it cooked it turned out perfect! Trust the directions. Our only regret was not making more. The end product was a delicious thin crust (very cheesy) pepperoni pizza! We will definitely make this again. I made two pizzas with this last night and it was a Amazing!!!! I will admit the first batch that I made I put shredded Parmesan (instead of grated) and mozzarella into the mixture because I miss read the information. I thought oh well I’ll give it a try since I’ve already mixed it and I have another batch in case it doesn’t turn out. The crust was more floppy than I thought it would be but it turned out so cheesy and full of flavor. (next time I’m going to try to flip it and cook it on the other side maybe it’ll be a little more crispy) The next batch I made it with just the grated Parmesan and I actually liked it with the shredded Parmesan instead. Don’t get me wrong they both were amazing but I preferred the shredded Parmesan over the grated, taste and texture wise. This will be the way I make pizzas from now on. A Cup measured at cooked or uncooked? The recipe does state riced then cooked. I read it a few times to make sure. ???? Can you pick this up per slice like real pizza? Or do you need to it with a fork? Do you mix the cooked cauliflower and egg with the mozzerella or cheddar? You just say cheese! Can frozen cauliflower be used? Added a little more cauliflower, cheese, and an extra egg to make a little bigger crust! I was able to get 6 cups of riced cauliflower – so SIX PIZZAS. I par baked them for 10 minutes and freeze them. I will add my toppings and cook for another 10 minutes when I need a pizza fix. You are absolutely right when you say that you don’t taste the cauliflower – just the toasted cheese that everyone loves. My only change is that I bake both times on parchment paper. Even with the spray, I sometimes have trouble getting the crust to release from the pan. This is the worst recipe! Do not follow unless you want burnt cauliflower and wasted time. Followed the instructions for microwaving the cauliflower, even significantly lowered the cook time to accomodate my microwave, and still burnt 3 times. Very disappointed! i made this tonight….it was delicious!!! This was excellent! Both my daughters loved it (6 and 2). My microwave must be pretty powerful- I only cooked the cauli for 6 minutes and it began to get browned and dry. I didn’t even have to drain it! Will definately make this again!!! i used coffee filters to remove the moisture from the cauliflower. Clean and neat! Made this for dinner last night and it was delicious! However, we had a really difficult time getting the crust off the pan (we did use oil spray liberally) and also, we had to eat it with a fork. Other than that, it really did the trick for our pizza craving. Just finished preparing this, and it was so good. I was shocked. It was a little on the salty side so I’ll cut back on that. Thanks for sharing! Loved it! I tried it a little differently!! I didn’t do it in the oven, but on the stove! It wasn’t as crispy buuuuut it was also amazing!!! Thank you so much! Definitely something I will try! Have you tried freezing either the “dough” or a pre-made crust? I wonder if that would work? This looks great! I’ve been enthralled by the cauliflower pizza crust for a while now! Love the idea of substituting things for cauliflower, but believe it or not I recently found a recipe for ‘cauliflower steaks’ which were just slices of cauliflower grilled! Looked delicious, but they were no steak substitute!!! Tried this last night. Best homemade pizza in years. Used fresh cauliflower from our garden. Wish we planted a lot more. Awesome recipe!!!!! I have recently been substituting cauliflower for half of the potatoes when I make mashed potatoes. I add butter, parsley, and a can of cream of celery soup. I leave it pretty lumpy–tastes amazing! I’m definitely going to try to pizza crust because it sounds delicious and even though I’m from Chicago, the Chicago-style pizza doesn’t thrill me. Thin crust rules! I just made this and I really cannot believe how wonderful this is! My husband LOVED it! He couldn’t believe it was a crust of cauliflower, eggs, cheese and spices. Fantastic! I have to say I was very skeptical before trying this recipe. I was surprised with how delicious it was! I was a little concerned with the dough as I was patting it out on the pan, it seemed pretty moist and I was worried it might not turn out, but it did. Thanks for the recipe! Do you have any suggestions as an egg substitute for this recipe? In the process of making it now! 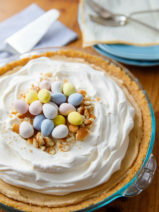 Will feature you and your recipe in my blog tomorrow so keep a lookout for it! Maybe we can work together in the future! I finally tried this recipe after wanting to try the cauliflower crust for a long time, and I thought it was FANTASTIC! The flavor was delicious (and I’m going to remember the suggestion to rice a clove of garlic w/the cauliflower), the texture was good (a tiny bit flimsier than regular thin-crust pizza), and best of all, low-carb for my husband, who needs to watch carbs now. I was hesitant to add a lot more cheese, since the crust has cheese, so I dropped goat cheese here and there and topped with red pepper, baby bella mushrooms and arugula. So, so good! And, I feel like the base crust offers lots of options – I’m thinking base for appetizers, like a replacement for the cold veggie pizza seen at lots of parties :) Can’t wait to experiment some more!! Most pan sprays have flour in them so use Olive Oil, it also comes in a spray now. This recipe is very good, just remember to dump the processed cauliflower in a tea towel to wrong it out before mixing in the other ingredients. You will see that it taste more like pizza crust. thought it was kind of mushy going into the oven but it was fantastic when it was done! will be using this recipe many more times thank you! Loved the flavor!!! Should the bottom be crispy? Ours was floppy and we ate with a fork but I’m not sure if that is how it is supposed to be or not. I cooked it on a pizza stone. Kids loved it too. OMG!!! SO GOOD! Even my 16 year old son gobbled down two pieces and was asking for more! We have a 7 year old friend that is VERY picky, we are going to try it on him next. I’ll let you know. This was very good! It did not fall apart. I made mine 6-7″ instead of 9 . Thank you for the recipe! OMG!!! My husband and I are doing a 10 day detox – no dairy and no gluten. Been looking in to this cauliflower pizza crust thing and this is.delicious. So much flavor!!! Will.definitely be making this again. I put fresh tomatoes over the olive oil and garlic brushed over the crust, then fresh spinach, and on the other side I sauteed some onions, mushrooms and peppers and put those over the fresh tomatoes. Then I put some non dairy/non gluten cheese on top . Its amazing!!! Crust was yummy– ended up sticking to the cookie sheet like crazy. So just peeled it off and ate it by itself without anything on it. Tasted like a very odd and delicious omelette. You can pop a few garlic cloves in the food processor while you’re ricing the cauliflower. SOOO yummy. Unless you were using a dry mozzarella then, my bad. I made a couple of these after spotting them on The Londoner. They are delicious but I have to ask – how did you manage to transfer 2 intact slices to a plate to photograph? Mine stuck to the baking paper and didn’t hold the shape of traditional pizza slices…they crumbled…but they do taste deeelish! I tried the cauliflower pizza crust yesterday and it was excellent. Now I don’t have to worry about the dough. Mixing the herbs, garlic and cheese really made the crust taste terrific. I use a pizza stone and it bake beautifully. Added fresh tomatoes shrimp and 3 gourmet cheeses. Fanstastico. If you don’t use a microwave, can the cauliflower be steamed? baked? Thx. Thank you for this recipe. My daughter is gluten free amd it is a pain trying to find a dough that passes her approval. this can’t help but work since she really likes cauliflower. Oh wow! Thank you so much for this recipe. Just tried this and it turned out amazing! Love it! WOW!! I can’t wait to try this! I’ve never heard of cauliflower crust before… Thanks for sharing! This has got to violate some law of nature. I’ve seen this idea floating around the internet but haven’t tried it yet. I think when I do, I will be hooked. Perfect way to sneak in veggies to unsuspecting mouths!! Every time I see a black crust (burnt or charred), either on bread, steak or any thing baked or fried, I can’t stop thinking of the cancer risk. Charred cauliflower – no go! Otherwise, cauliflower pizza crust sounds great. I just made this for the first time and it was amazing!!! Thought my pizza days were over but not now!! Oh yum! I’ve been noticing just recently how versatile cauliflower is, but never in a million years did I think pizza crust. Can’t wait to give it a try. Might be the perfect way to sneak a veggie to my eldest. Pingback: P i z z a ! ! ! ! ! ! Pingback: Homemade Pizza | Be Healthy! Made this for dinner last week. It was amazing! You should definitely try this recipe! Make sure to spread the middle super thin as it seems to cook a bit slower than the edges. Bon appetit! 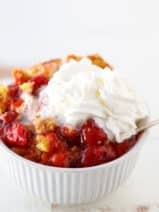 I gave this recipe a try last night and it was awesome! I was really surprised with how well the cauliflower held it’s shape like dough. It was pretty delicious too. I totally have to try this, the crust by itself even looks scrumptious! Love cauliflower crust! My new fav cauliflower recipe is Fake Potato Soup. I do a traditional baked potato soup and sub cauliflower for the potatoes. So yum! Love your pics, too! I don’t own a microwave, what would be the substitute? I’m guessing just sauteeing it a little? I put it in the oven spread out on a cookie sheet on 375° for 15 min. Works great! I was going to make this soon, and I dont have a microwave either. Im just going to boil the florets a bit, then chop fine by hand to avoid it becoming mush in a blender. Thank u so much for asking eco-baby, as I don’t have a microwave either. Rowan, your answer works great – especially now that our extended Indian summer is over here in Los Angeles! I too feel awful after eating pizza lately, never use to make me feel so bad. Pizza is one of my favorite foods. I might need to try this recipe out. Thanks for sharing.